The world does not need another modern retelling. Yet the name recognition of authors enticed me. One of my favorite authors, James Patterson, presents a modern retelling of a classic Indian legend by Rachel Roy and Ava Dash. A coming-of-age story written by celebs! I am not familiar with the Indian legend of Shakuntala and Dushyanta so I cannot compare the two stories or rate the accuracy of the retelling. However, it is very modern and current far as dialect and event happenings. Raya Liston is a 17-year-old high school graduate just accepted to UCLA. Then her beloved grandmother dies with a final wish: visit the ashram in India. Raya and her cousin spend their last free summer traveling to India together. Raya hopes to find her true path (young as she is). She did not expect to fall in love or learn there are 96 ways to say the word "love." Deepak Chopra says 96 Words for Love is "a feast for your soul." Kim Kardashian West calls it "a universal love story as fresh, vibrant, and stunning as the backdrop of India it is set in." I say kudos to this mother-daughter duo penning a story of self-discovery in a unique setting. 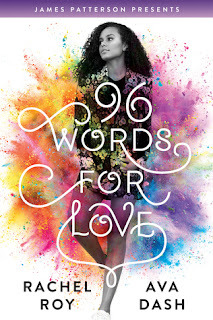 Was 96 Words for Love worth stepping out on a limb to read this YA novel presented by James Patterson, written by mother-daughter team, Rachel Roy and Ava Dash? Yes indeed. Their Indian immigrant heritage gave credibility to the traditions told in the book. I expected a shallow YA first love type of story but instead was treated to a coming-of-age story where I learned tidbits about Indian culture and ashram living. But 96 Words for Love is not deep reading and may be meh to adults. I recommend high school students or college freshmen borrow it from the local library then research topics they found interesting (like finding the other 95 ways to say "love").